I am the Captian of my 26ft fishing vessel (sea's The Day Fishing ) I fish out of the bay Of Quinte in the Spring,Fall, &winter months for trophy Walleye, and we fish out of Wellington ON, and Port Credit in the Summer months for King Salmon / trout on Lake Ontario. come check us out and take a tour. This weeks tip is Bottom bouncers. I find using bottom bouncers paired with a worm harness extremely useful here in the Bay Of Quinte, especially in the spring when you are trying to get those small baits down deep when you are marking walleye on bottom. Bottom Bouncers are an easy solution. They come in many different sizes and it can be intimidating trying to understand which one to choose, well I’ll simplify it for you. 1st, know the water you will be fishing in, take a look at some charts of the body of water you will be fishing before you leave your house, take a good look at the depth of the area on the maps. once you figure out the area you’ll be fishing in then all you need to know is, when choosing a bottom bouncer you need approx. 1 ounce weight per 10 feet of water. when deploying the bottom bouncer you want to be travelling at your desired speed and quickly feed your line with tension behind the boat until you can feel the bottom through your rod. once that happens allow your boat to move ahead a bit until the bouncer comes off bottom then slowly let back a bit more line until you can feel bottom again then set the bail this should give you the desired 45 degree angle that these devices are meant to be used. Your worm harness will typically be anywhere from 1 to 2 feet behind the bottom bouncer in the spring. I personally like to use a Colorado or larger blade on my worm harnesses in the spring time because it slows the presentation down a bit. Either a live worm or a plastic worm will work well when paired with a worm harness. I hope this Tip was helpful and come back to this site next week for you next Bay Of Quinte Tip Of The Week. Over the next few weeks leading to the Walleye opener on The Bay Of Quinte I will be writing helpful hints and posting them to my blog this week my blog is about Planer Boards. If you fish for walleye in The Bay Of Quinte one of the most useful tools to get the job done is the Off-Shore tackle Planer Boards, these light weight boards are designed to take your lure away from the boat allowing you to get more lines in the water without getting tangled, also by taking the lines away from the boat your lures will run over the fish without your motor spooking the fish. These Boards come as either right or left running which means they are meant to run on either the right or left side of the boat. One major advantage to running these boards is that it allows you to put your lure in very shallow areas while keeping your boat in deeper water or (safer) areas. Many times when you run over fish they spook and move off to the sides of the boat which means as you run over them with the boat the fish actually swim away from your presentation, by using the boards you use them to your advantage in this case because as the fish swim to the sides they are now swimming directly into the path of your lures. 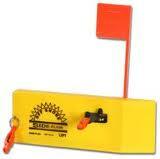 A great option that these board have available is you can buy a additional flag called a tattle flag what this does is when properly set up even if you have a small fish (bait fish, pearch, silver bass, or even weeds) on the line or if the fish is on a light bite, the lightest tug and the flag will go up and down repeatedly letting you know something is on the line otherwise it might be difficult to tell. I would suggest this tattle flag especially in the spring time. Targeting those winter walleyes that are not necessarily in feeding mode, you have to find them where they spend the majority of their time in the depths. That’s not to say that they’re not out roaming the open basin of the Bay, but they will be close to it. You will want to target staging areas where the deep basin runs close to the shallower areas where the walleyes are moving up to feed, Especially where the fish are holding in preparation for moving toward spawning areas as spring approaches. This may be a deep flat just out from the mouth of a spawning river, or even a basin area adjacent to rocky/sandy shoreline spawning areas. It could be a thirty foot flat that runs along a wall, or it might be the forty foot drop off the end of a main point. 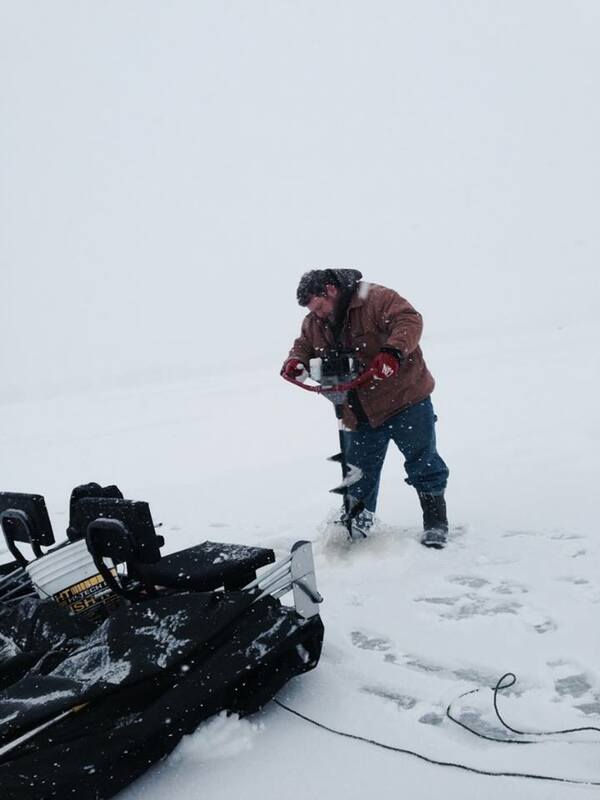 I suggest several pieces of equipment that I think are crucial to finding these winter walleye. 1st a decent ice flasher. A flasher will help you quickly, after drilling a hole in the ice, figure out weather or not that area is holding fish . 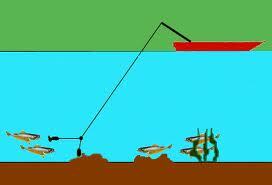 2nd it will allow you when using different presentations, figure out what is making the fish strike that day. (when choosing a flasher take into consideration that a mapping system (GPS) is the second piece of equipment I will be suggesting) there are decent flashers on the market today with GPS capabilities that won’t break the bank. 2nd a GPS. Walleye will be found in a specific area on the bay and may hold that position for several day’s/weeks before moving to a new location. A GPS will put you right back on fish you find, and takes any guess work out of it. If you have a smart phone you can download the Navionics apps for this tool and do not need to purchase an expensive separate unit. As for the rest of the gear needed that’s a whole different Blog. Scouting, Scouting can be done any time of the year in the open water season, however the best times to do this is in the post spawn and late fall seasons as these are the areas that tend to hold good walleye in the midwinter months as well. Mark these areas on your handheld GPS units. Once you’ve located a general area to scout out, it’s a matter of drilling several holes and using the flasher to scan the bottom for signs of life. Walleye’s tend to be rather slow this time of year, I often will go ahead and work the spot for forty five minutes to an hour before even thinking of moving to a new location. Earlier in the season I may only stay on a spot for 15 to 20 minutes. In order to bring walleye in for a look I usually use a second line in a separate hole approx 2.5 feet apart from my primary jigging hole. In this hole I put on a Clackin Rap and jig it vigorously for a few seconds every few minutes. If any curious walleyes are in the area you will pick them up on the sonar. Sometimes they even smash the Clackin Rap instead of my primary jig. Hi everyone I am just starting my blog on this site so for my first Blog I would just like to welcome everyone to take a look at my page and if you have any comments or suggestions on what content you would like to see on here to please send me a message and I will do my best to keep this interesting to my viewers.